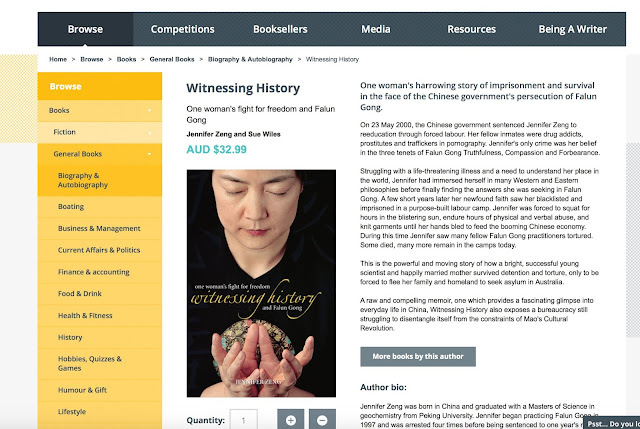 "This Book Should be Compulsory Reading for the Younger Generation"
Letter from a Friend re Witnessing History:What a great book you have written! Letter from a Friend About "Witnessing History-one woman''''s fight for freedom and Falun Gong"
"Oh gosh JenniferI am in absolute tears reading your book this morning; how many other practitioners are being ''''''''transformed'''''''' around you, and you feel the hand in your mind trying to make you breed demons in your own mind... then you call out to God ''''''''Why hast thou forsaken me''''''''... so powerful, so real, so honest, so tragic... I really feel your pain. So amazing you survived. You survived the thousands and thousands of demons, and what saved you was not wanting to ruin the other non-practitioners who had faith in you, your strong will to save others, your pure compassionate heart."